Come along on my ”quest” to make the Ubass work in all kinds of different settings! Magnus has been playing bass some 25+ years. He started out in local rock bands playing in his friends basement and garage! Then followed some years of studying bass and music. He took bass lessons while studying at a ”folkhogskola” in Sweden in the late 80s. Meeting new musical friends and styles there. 1996 he graduated from the University of Orebro with a masters of fine art in music education degree. 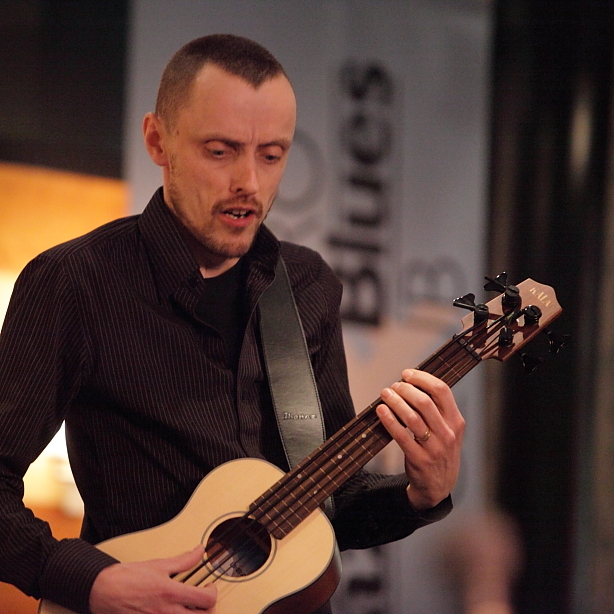 Since then the mix of playing gigs in various genres and teaching has kept him busy. Finding out about the Kala UBass was a nice surprise. Trying to find fresh new ways of expressing his music has always been important. The UBass is one of those fresh new instruments. It makes you look at music making in new and inspiring perspectives! Please subscribe to my blog! You can do that in the top left sidebar! …and why not check out my other blog too! Here’s a link to my Ubass videos on YouTube! Hi, I read so much on your site before buying my Kala black solid body u-bass which I’ve used a few times on-stage. Last time was last night. I’m a bass player of about 25 years and love the idea of the u-bass but I wondered if you had any tips for tuning as I’ve tried the normal tuners you can attach to the headstock but they dont’ work at all. I bought an EBS Studio 60 amp and I’ve just bought a BOSS LMB-3 Bass Enhancer to improve the sound of the lowest string. But I wondered how long it takes to get used to the relative slackness of the strings in comparison to those on a normal electric bass? I hope you have found some interesting things on my site! The solid body SUB has a lot of low end (hence the name – it was designed with this intention) You say that you feel that the Low E is a bit softer in volume compared to the rest of the strings. Sometimes just adjusting the position over the bridge saddle can help a bit! Playing through a PA with a sub really bring out the great low end. But that’s of course not always possible. I have played a lot of gigs through a BOSE L1 Compact system and the extra low end the sub in that system provides is great. Sometimes a combo will have a hard time with the lowest bass and I know that some players use a low cut/hi pass filter to take out those sub (below about 30 Hz) when they play through a smaller amp. I have never done that and I my smallest rig uses a 10 inch speaker that I feel works great in small rooms. And I don’t feel that the cab had to much trouble with the lows at moderate volume levels. I’m planning a test of three different cabs using the same amp! I’ll post this on my blog as soon as I had the time to do the test! Good luck with your Ubass playing! Thanks Magnus. I understand what you are saying about ”just playing”. Maybe I’m too hung up on that lower string. I’m gigging tonight so I’ll see if I can put into practice what you suggest. A friend recommended the new Kala strings, I forget what they are called, but he said they were less rubber-like and more like the steel strings found on a conventional bass. I’ll look into that in case I find them easier to play. PLus I’ll play around with my Boss pedal and what difference that might make. Thanks for putting together such a great site for us ”U-Bass’ers”!! There are (at least) four different stings for UBass. 3. ‘Rumblers’ Made by Aquila for Kala. Similar to the white Thundergut’s (but with a grey finish). 4. Pyramid. More like traditional steel strings. Good luck at the gig! I think it’s the Pyramids. I’ll give them a try and let you know how I get on. Cool! Good luck and keep me posted. Hope they work out for you! I’m glad you find my blog/site useful! I haven’t got the specs for the built in pre-amp, EQ and tuner but I believe it’s battery powered while the Mi-Si uses a charger. (Charge for 60 sec and get about 8 hours of playtime). I can try to check with the Kala guys to get some more details! Is it mainly the battery thing you want to sort out or is it something more you’re curlicues about? One more question: Do you plan to buy the fretted or fretless version? I’ve got the 2010 model of the same Ubass (fretless). (Without pre-amp since they weren’t available then). It’s the Ubass that is featured in most of my videos. I’m super happy with the spruce model and I hope you will love it too! thanks for the quick reply. my main concern is the battery. i would actually prefer the battery powered one because the batteries are readily available here in the philippines. if it were the charger i would be constantly afraid of what would happen in case it breaks (or i lose it). unless the charger is generic, like the ones used for cell phones. the only solid spruce top model available here is fretted, so i’ll go with that because that’s what i’m used to also. i would like to someday get a fretless also, though. right now i can’t wait to get my first u-bass! it’ll most probably be this weekend. i’ll be sure to send you pictures of it. The answer you wanted, right!? I wish you the best of luck with your Ubass purchase and may you have many great moments making sweet music with it! Take care and if you want please subscribe to my newsletter that will come out about every other month. I will try to write about stuff that haven’t been a post on my blog of Facebook page! yes, that’s what i wanted to hear! 🙂 it’s easier (and very cheap) to just buy a handful of those batteries than carry around a charger. i’ll be sure to take a nice photo of myself with the u-bass once i purchase it. i subscribed to your newsletter just now, and i’m planning to also write about the u-bass in my blog (which by the way is jonalism.com) 🙂 many thanks for all the help! I’m glad to be able to help! I’ll check out your blog too! I just check the link you posted. It looks like a nice deal. The case that is included is really nice! I have been thinking of getting one instead of the gig bag style I’ve got now. Do you live near the seller? In that case I would suggest that you try to meet up. This way you can try it out and check so it’s all good with no cracks and that it plays well! Since that version (I guess the original) was delivered with a passive piezo setup I would strongly suggest that you get an outboard pre-amp to put between the Ubass and the amp. That way you will get a nicer and more warm sound! I have used a couple of different ones. The first one (I used it for a long time and still do from time to time) was an old Fishman pre-amp. It was a clip-on version with volume, treble and bass controls. This way I can use it attached to my strap and easily adjust volume and tone! Since then I have used the Headway pre and for almost a year I’m endorsing the RMI Basswitch IQ/DI which is really great. It has a lot more features that makes it easy for me to switch between different basses when I play concerts. I will include some links to previous blog posts about pre-amps below! i want to ask you one more thing about the passive pickup: does it pick up the sound of the soundboard also, like the active pickup does? i mean, can i get a sound if i tap or hit the soundboard when plugged in? i’m a pretty percussive player and i would want that to be a feature on the ubass i would be playing. No worries, I’m glad to be able to help out in some way! I do think this ”offer” is good and I hope you will be satisfied! I have made some videos with a bit if percussive ”on-the-top” (maybe not over the top, but still 😉 playing. To accentuate the second one I did I also recorded with a condenser mic. This is of course not ideal in a live setting. In the first video (take the A-train looped) I played dampened strings by the bridge to get some kind of bass drum/snare percussion backing to play over. I haven’t played UBass models with built in preamps that much so I can’t really compare. But I do think it will be about the same with the passive. However getting some kind of preamp suitable for piezo pickups is a great way to enhance the sound of the passive pickup! Good luck! Great Jon! Good luck with the purchase! I enjoy your Bass Playing!! I’m Looking forward to more uploades from you. Hi Magnus. I checked ur youtube vids which got me to get my own ubass. You have made ubass sounds so good. I got myself a new mahogany ubass. I was happy with the feel but found few problems with it. 1)I have tested all the bass at the store but all have the same low volume for the E string but much louder for A, D & G. Is this a problem with the piezo placement? 2)Besides that, i found that my bass have a constant loud hum when plugged to my amp. I did have this problem when i tested my bass at the store & plugged through my audio interface on my laptop on battery mode. But when my laptop is using adapter, i get the hum again. I checked on talkbass & realised there are others who had the same issue. 3)I am also using the pahoehoe strings that came with the bass. I listened to your bass tone on youtube and preferred this strings than others. However, it is so hard to keep the bass in tune and i hv been tuning & streching the strings everyday. Do you have any tips to keep it in tune faster? Hope you can help to solve my problem. Thank you so much. 2. Do you have the new model with a built in pre-amp or an old one without the pre-amp? I have not experienced this but it sounds like a grounding problem. Have you tried different instrument cords? Are your amp plugged in to a grounded wall outlet? My acoustic/electric Ubass is the one without pre-amp so I have always used an outboard pre. Maybe you can find something useful on my tips and trix page? Will try to add more stuff to that page soon! Did the guys in the talkbass forums offer any suggestion? 3. Not, really. It takes quite some time to get them to settle in. The Pahoehoe takes longer then the Aquila strings because the are more stretchy. I have found that my ”knot” method works well with all types of Ubass strings. I have a video that shows how I put on a new set of strings on my acoustic/electric. It’s the thunder reds in the video but I think you can use the same technique for all the different rubber-like strings. I hope my answers help you get closer to a more enjoyable playing situation! Ubass should be ”all fun” to play! bonjour Magnus j’ai des questions sur la kala ubass hutch hutchinson car je veut en acheter une . comment est elle ? tu la tester ? l’acces au aigue pour les solos est plus facile ? je te vois pas jouer avec pourquoi ? Hello Magnus I have questions about kala ubass hutch hutchinson because I want to buy one. how is she ? you test it ? each access to acute for solos is easier ? I see you not play with why ? I have not tried the Hutch Hutchinson model yet. I do believe it will make upper register playing easier but since I don’t have one I have to make the best of the situation and play those high notes with a little bit more struggle! I hope you get one and let me know what you think about it! Good luck and all the best from Sweden!